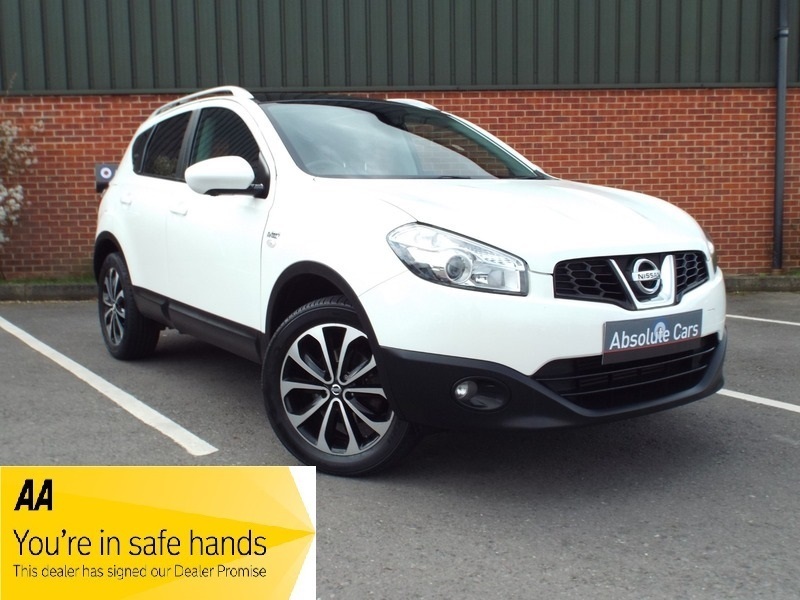 ABSOLUTE CARS have this, ever popular, 1.5 Nissan Qashqai in solid white with 18" alloys & boasting a full panoramic glass roof, sat nav, Bluetooth & a colour reversing camera. An ideal family car. Call in for a test drive, finance arranged & part exchange considered., 3 months warranty, Next MOT due 24/10/2019, Last serviced on 22/06/2018 at 33,662 miles, Full service history, Black Cloth interior, 5 seats, White, 2 owners, 18in (Onyx) Alloy Wheels, 2Din CD Player with USB, iPod and Aux Inputs, ABS with Brake Assist, Active Front Headrests with Height Adjustment, Rear Headrests, Around View Monitor, Bird-View Parking Assist, Colour Front, Rear and Passenger Side Cameras, Auto Lighting System, Bluetooth Integration, Centre Rear Seat Belt, Cruise Control with Speed Limiter, Drive Computer, Drivers Airbag, Drivers Seat Lumbar Support, Dual Zone Climate Control Air Conditioning, EBD, ESP, Electric Speed-Sensitive Power Steering, Electrically Adjustable, Folding and Heated Door Mirrors, Engine Immobiliser, Front Centre Console, Front Fog Lamps, Front and Rear Power Windows with One-Touch and Anti-Trap Device (Drivers Side Only), Front and Rear Seat Armrest, Graphite/Stone Cloth Trim, Height Adjustable Drivers Seat, ISOFIX Childseat Anchorage Points (Rear), Leather Gear Knob, Leather Steering Wheel, Nissan Connect 5in Touch-Screen Navigation System, Panoramic Glass Roof with One-Touch Shade, Passengers Airbag, Puncture Repair Kit, Rain-Sensing Wipers, Rear Door Child Locks, Rear Privacy Glass, Remote Central Locking with Superlocking, Satin Silver Roof Rails, Side and Curtain Airbags, Six Speakers Audio System, Third Brake Light, Tilt and Telescopic Steering Wheel Adjustment, Traction Control, Ultrasonic Alarm System, AS WE ARE AN AA CARS DEALER THIS VEHICLE COMES WITH 12 MONTHS AA BREAKDOWN COVER.